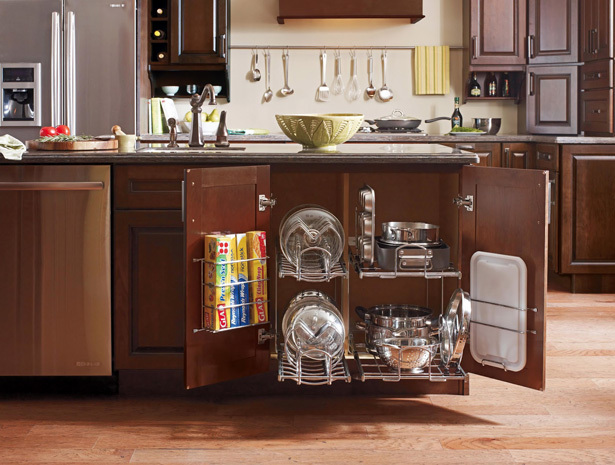 Offering an array of countertop styles and materials for your kitchen. Since 1987, through a fusion of science, technology and artistic talent, we’ve been creating quartz surfaces which are not only beautiful to look at, but also superior in adaptability and practicality. Whether you’re a professional designer or simply looking to create exceptional personal interiors, our surfaces are a starting point for your creative endeavors. With four diverse collections – Classico™, Supremo™, Motivo™ and Concetto™, you can go smooth and sleek or textured and embossed; the choice is yours. Kitchens and bathrooms look great dressed in Caesarstone, but we’re sure you can think of many of more ways to use them. Think feature walls, floors and stairways, or even custom-made furniture. We simply provide the tools for you to put your unique stamp on any room, and create an interior finish which is strikingly different than any other. Strength & durability — Cambria Natural Quartz Surfaces™ are stronger than granite. Cambria is a surface that is truly everlasting. Maintenance free — No sealing, polishing or reconditioning is needed. Simply wash with warm water. It’s that simple. Plus, unlike granite, Cambria will resist stains from common food items such as wine, coffee and tea. Food safe — Unlike granite, Cambria has been certified by NSF International as safe for use as a food preparation surface. Cambria is nonporous; therefore, food and moisture cannot penetrate the surface — the main source of growth for harmful bacteria. All natural — Cambria is created from pure natural quartz, an extremely hard stone. In fact, quartz is the hardest non-precious stone that can be found in the earth’s surface. 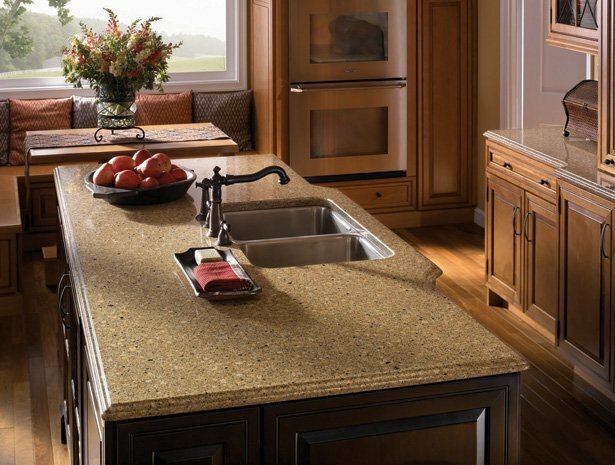 Everlasting value — With its beauty and performance advantages over granite, a Cambria kitchen countertop or bathroom vanity will add value to your home. Guaranteed — As the only producer of quartz surfaces in the United States, Cambria is covered by a Lifetime Limited Warranty. 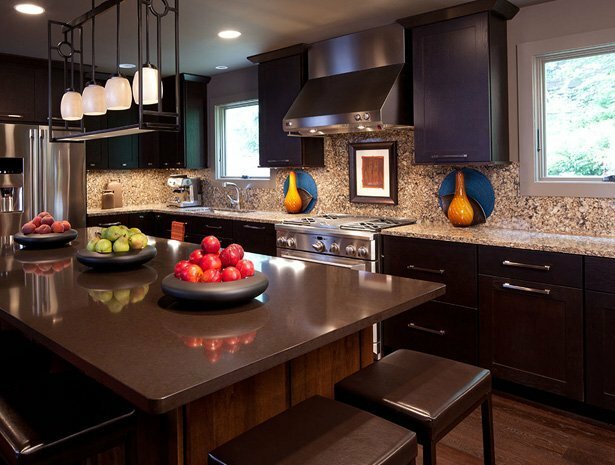 The right kitchen countertop should provide durability, aesthetic appeal and function. Follow the latest trend. Start your own. Do something positive for the planet. Surround yourself with sophistication. There’s one solid surface that gives you the ultimate in freedom of expression and choice, in your kitchen, your bath, and throughout your home. It’s DuPont™ Corian®, it’s your surface. The one that makes whatever you see in it possible. Silestone® is the world’s leading producer of quartz surfaces designed for high-quality kitchens and bathrooms, including countertops and sinks with advanced bacteriostatic technology. 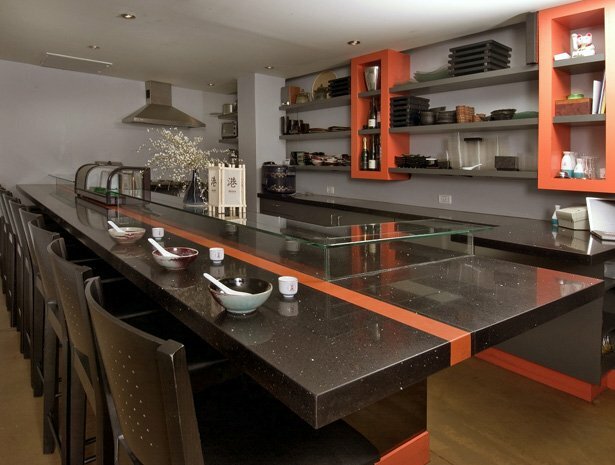 Silestone® is the only brand that offers a certified warranty, in writing. Only a global leader could once again draw ahead of the pack and offer a genuine 15-year transferable warranty for Silestone®. Silestone® is a compound made of natural quartz, which makes it extraordinarily hard and resilient. This is the one and only countertop made of quartz with bacteriostatic protection, giving it hygienic properties that are not to be found anywhere else on the market. It is an excellent surface for kitchen countertops, bathrooms, floors and wall cladding using the minimum number of joints. 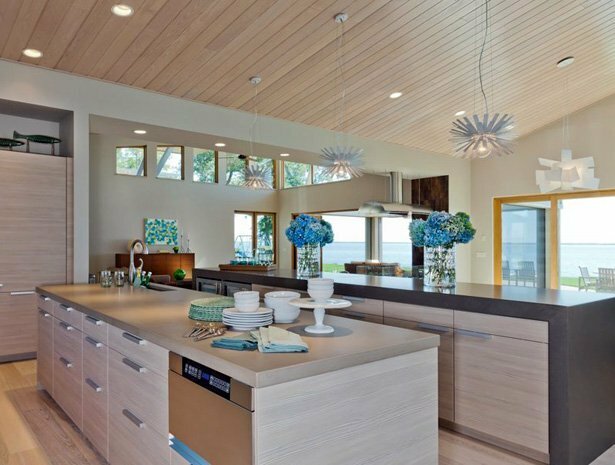 In addition, it comes in a variety of different shades of color, offering a number of decorative possibilities from a single kitchen countertop to projects throughout the home. Silestone® is an investment for the future. Silestone® is forever. Marble and granite countertops are created by nature and skillfully re-designed by man. These beautifully natural materials add character and warmth to kitchens, baths and other areas of the home with a richness that cannot be duplicated in synthetic materials. Granite and marble countertops are not only extremely resilient and easy to clean, they add a gorgeous element of style and sophistication to any room. Floorcraft provides a unique selection of marble and granite countertops at the best prices available. We strive to provide our customers with a variety of options to ensure the kitchen and/or bath of your dreams can be built. Floorcraft design experts are available to help you create your dream kitchen and bath with marble countertops or granite countertops that will impress for years to come. The illustrious look of marble and granite will bring your entire design together. We have marble and granite samples available to view, demo kitchens to experience, as well as computer software programs that will offer a virtual glimpse of your new granite Countertops! Our facility is beautifully organized to help make your shopping experience easy, hassle-free, and pleasant. Our experienced and knowledgeable staff will also help you make the hard decisions with unbiased and professional advice. Call 415-824-4056 to schedule a consultation!